This chapter examines the implications of business-to-business (B2B) commerce for the buyer-supplier interface. Innovations in electronic commerce have a key role to play in managing inter-organizational networks of supply chain members. 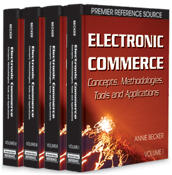 The evidence presented in this chapter illustrates that the Internet represents a powerful technology for commerce and communication at the buyer-supplier interface. Internet technologies are having a considerable impact on the communication patterns at the buyer-supplier interface. It is shown how electronic commerce technologies have the potential to create competitive advantage through radically changing the structure and interaction patterns at the buyer-supplier interface. The chapter identifies a number of areas where electronic commerce technologies can make a contribution to the creation of competitive advantage. While the Internet offers ways for organizations to communicate and trade more effectively with their suppliers, and gives consumers higher levels of service and sophistication, it also poses major challenges to those within organizations who have to manage it. It is argued that closed network problems and the nature of buyer-supplier relations present major impediments to electronic commerce achieving its full strategic potential at the buyer-supplier interface.